I had to miss church this morning because I woke up in the middle of the night with chills and nausea and all that fun stuff. I am still feeling pretty aweful but I was able to spend a little of this rare time alone just resting and reading and remembering. Things I never seem to have the time to do... so in a weird way I am thankful I was forced to quiet myself this morning. I think God knew He was going to have to cause me some discomfort to get me to just stop and it is especially needed this week. The coming weeks are always hard for me. 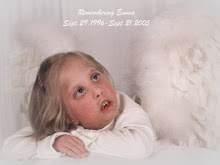 It is a strange and conflicting time for me as I absolutely love fall and want to savor every moment of it, yet it is also the time that I remember the birth... and death of my Emma-girl. I have noticed that leading up to this time this year I have put a wall up around my heart, trying to block out any memories or feelings that pop up uninvited. I've just determined I am going to push my way through and breathe a sigh of relief when October arrives and I can put September behind me for another year. But, because God knows my needs far better than I do, He set aside today as a time for He and I to break down those walls for just a while and spend some time together just renewing my strength and allowing me to remember and reflect while feeling safely held in His arms. I am so thankful He knows me so well. Though these times can be hard emotionally, they are so sweet and necessary. I took the time to open a cedar chest that sits at the foot of my bed. One I don't open very often anymore because when I do it is like opening a wound in my heart and feeling the pain over and over again. This morning as I opened the lid I was overwhelmed once again by the memories and emotions as I looked at pictures, books, cards, toys, clothes, blankets... I held them to my face and tried to breath in any smells that might still be lingering and I wound the toys to hear the music that used to make her smile. All of these things, so precious to me because they are all I have to physically remind me of my sweet girl. Yes, I do enjoy remembering her and the ways she filled my life with joy and meaning. It is good to remember but it also still fills me with so many questions that have no answers. The whys and what ifs... they still haunt me. I went to a verse that has brought me comfort through the years. It is found in Psalm 84 and says, "Even the sparrow has found a home...a place near your alter." I love that verse because of the special meaning it has for me personally. We always referred to Emma as our little "sparrow" because of the song His Eye is on the Sparrow, so when God showed me this verse one day when my grief was still so fresh I held on to it tightly in my heart. Knowing that she had found her home next to His alter brought me comfort. And the next verse reminded me that she is so blessed to be dwelling in His house "ever praising" Him. So, that is where I went this morning... to the verse that comforts my heart. I read the whole chapter several times and a couple of verses really jumped out at me in a new and fresh way. "Blessed are those whose strength is in You, whose hearts are set on pilgramage. As they pass through the Valley of Baka, they make it a place of springs; the autumn rains also cover it with pools. They go from strength to strength, til each appears before God in Zion." Several things just really stood out to me this morning. You see, I really struggle with this whole longing for Home thing. I am so ready to leave this world behind me and go to the place I was made for. I know that sometimes I get a little frustrated with the waiting and feel restless for more. That's how I feel in September especially, so the words "whose hearts are set on pilgramage" really struck me. Yes, I need to have an eternal perspective but for right now God is choosing to keep me here in this world for a purpose. It is a pilgramage for sure. So, while I should long for Heaven, I should also set my heart on the pilgramage before me and find my strength in Him who goes before me. I love the next verses.. "as they pass through the Valley of Baka, they make it a place of springs". Wow, did that hit me hard! The word Baka means "weeping" so the Valley of Baka must have been symbolic of times of struggle and grief. So when I am passing through theses valleys in life I should be doing what I can to take these dry and barren places and fill them with springs of water. Each September when I experience my own valley of Baka I can make it a place of life and not death. It says, "the autumn rains also cover it with pools". The autumn rains... the autumn rains... autumn... my time of Baka- they cover the valley with pools. Each year when I walk through this valley I can leave behind some pools of living water, of strength and trust in God to get me through. Oh, how I love that God led me to that verse this morning. Autumn doesn't have to just be about the valley of Baka anymore... but about the pools of water God provides in the desert of my grief. "They go from strength to strength, till each appears before God in Zion." And it takes me right back to that longing for Zion. It is a good longing, one placed in my heart by God Himself. But, for now, I am still on this pilgramage and I will walk through the Valley of Baka again and again. But when I do I pray that God will give me the strength to leave springs in the dry places so that when I come back to it each autumn I will find it less empty and barren than the year before. I will find some pools of living water to sit beside and rest my weary soul. So this morning I thank God for a little sickness that pushed me to spend some necessary time in the Valley alone with Him. I have found strength for the pilgramage before me and life in the spring of His word. And my sparrow... well, she is in her Home ever praising her King and God. And my heart rejoices with her.